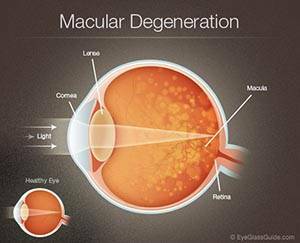 There are various types of macular degeneration. However, the most common form is associated with aging, this eye disease is also called age-related macular degeneration (ARMD). The main symptom of Macular Degeneration is slowly losing vision in the central part of sight. This loss precludes the ability to do many everyday activities, including reading and driving. It also reduces your ability to see intricate details such as small prints and patterns. The leading cause of vision loss in older Americans, 60 and older, is ARMD. There are two forms of this disease, wet macular degeneration, and dry macular degeneration. Both forms affect the central portion of the retina, which is the light-sensitive section located in the back of the eye. This part of the eye processes images and is essentially responsible for sight. The dry form of ARMD is more common than the wet form. In fact, almost 90% of ARMD is the dry form. The leading cause of losing vision in people over 60 years of age is macular degeneration. There are various risk factors, including smoking, obesity, and exposure to UV rays. Caucasians are at a significantly greater risk for contracting ARMD than African Americans. Additionally, macular degeneration affects women in greater numbers than men and has a genetic component. Macular Degeneration, which is also known as Age-related Macular Degeneration (AMD), because it is usually associated with aging, is a leading cause of vision loss in adults aged 50 and older. The disease is characterized by a gradual loss of central vision and can occur in one eye or both eyes simultaneously. Macular Degeneration is a disease that damages the macula, which is the center of the retina responsible for sharp visual acuity in the central field of vision. The breakdown of the macula eventually results in the loss of central vision and the ability to see fine details. While AMD doesn’t result in complete blindness, the quality of vision is severely compromised leading to what we refer to as “low vision”. Dry AMD is the most common form of the disease. It is characterized by blurred central vision or blind spots, as the macula begins to deteriorate. Dry AMD is less severe than the wet form but can progress to wet AMD rapidly. Awareness about the disease, the risk factors, and prevention are critical, even for younger generations because taking care of your eyes while you are young will help to reduce the risks later on in life. Race: Caucasians are more likely to have AMD than those from the Hispanic or African-American descent. Proper nutrition and regular exercise: Research indicates that a healthy diet rich in “Eyefoods” with key nutrients for the eyes such as orange peppers, kale, and spinach as well as regular exercise may reduce your risks or slow the progression of AMD. Dietary supplements: Studies by the National Eye Institute called AREDs and ARED2 indicated that a high dosage of supplements of zinc, vitamin C, vitamin E, and lutein may slow the progression of advanced dry AMD (it is not recommended for those without AMD or early AMD). Speak to a doctor before taking these supplements because there may be associated risks involved. Please call ahead to make an appointment. We would like to give you the attention and care that you need and deserve!